New York, NY—September 14th, 2015 — This October, Earth’s Mightiest Heroes are reforged, retooled and recharged for the All-New, All-Different Marvel Universe! 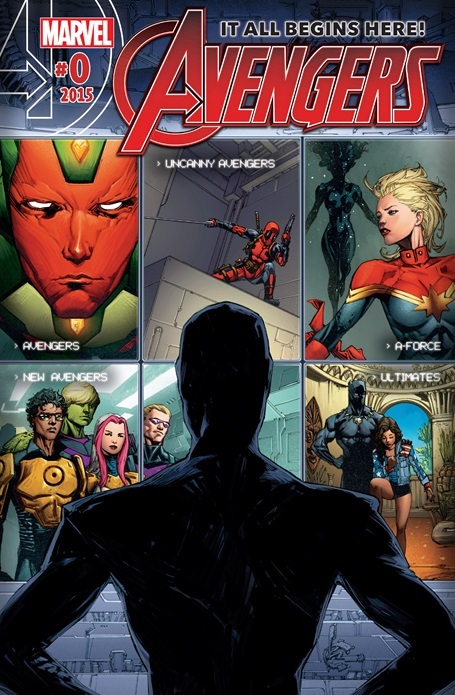 But first, kickoff the all-new Avengers line of titles with AVENGERS #0 – featuring new stories setting the stage for six new ongoing series! Someone is watching, carefully studying the movements of the Avengers and those in their orbit. But are they friend, or foe?! Find out in this exciting launch issue featuring new stories of ALL-NEW, ALL-DIFFERENT AVENGERS, SQUADRON SUPREME, A-FORCE, NEW AVENGERS, ULTIMATES and UNCANNY AVENGERS. Featuring all-star talents from across the comic industry, be there for the genesis of Earth’s Mightiest Heroes for a new era in AVENGERS #0! Coming to comic shops and digital devices on October 7th! 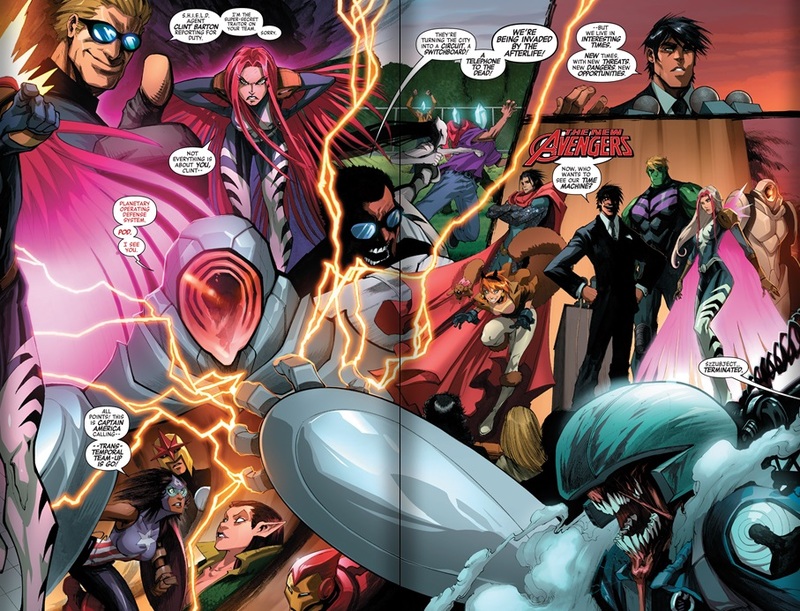 The New Avengers leave me the most interested; the glimpse into their future was intriguing. Roberto Da Costa/Sunspot has grown into just the black hero we need for a new generation. Hulkling crowned king of the Universe; presumably by virtue of being heir to both the Kree and Skrull Empires. 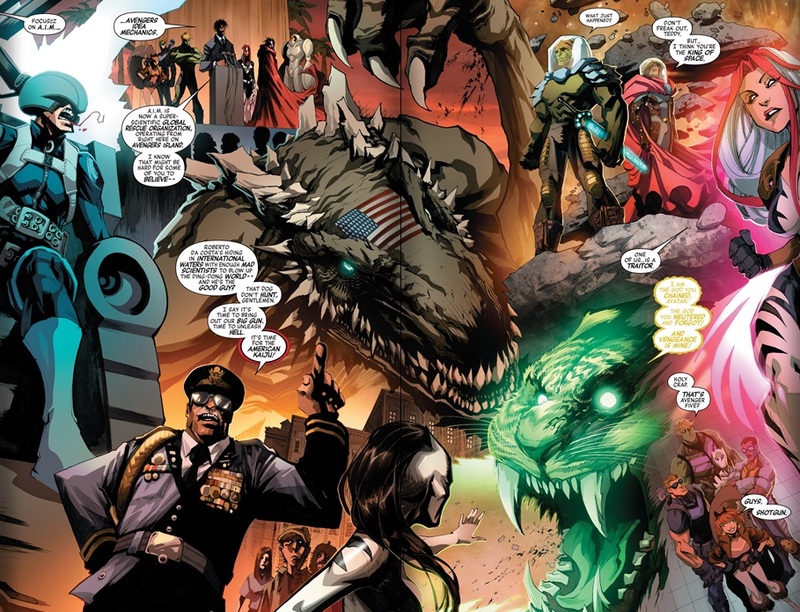 Ava/White Tiger is confronted by the Jade Tiger god she has held in check since her time with Luke Cage’s Mighty Avengers. We also see Danielle Cage of the future, the Captain America versions. Who are the alien threat flash frying precognitives for this info? That’s a mystery but we already know evil Reed Richards aka The Maker survives and will be causing hell on new Earth. The Squadron Supreme and our Ultimates are equally intriguing. The Uncanny Avengers are still a hard sell for me…I gave the first series a chance and stopped after about issue #5. I gave the second series a chance but it was just to make Scarlet Witch and Quicksilver no longer mutants which I thought was unnecessary. Deadpool joining leaves me even less interested. Thankfully this is currently the only place I can get my Doctor Voodoo fix so I’ll be picking it up out of duty. This is also the book which seems to be dealing with the fallout of the Terrigen cloud killing Mutants. Rogue’s life is in danger…which is weird since she is pretty much a 1/3 Human, Kree and Skrull the last time I checked but hey, let’s go with it. Miss American Chavez shows her stuff as both a pro LGBT superhero and an interdimensional heavyweight. Appearances by Black Panther, Monica Rambeau and Blue Marvel also added some much needed fanboy love. The art on this section was a special treat. This was very enjoyable read though Marvel has killed my interest in both Scarlet Witch…by retconning a central part of her history (Being a mutant) and I feel like I have already seen the story of an emotionless Vision…back in the 90’s. The Captain Marvel section introduced enough unknowns while tying into the Ultimates that it makes me want to at least read the first arc. Highly anticipating The Ultimates. I hope the writing is solid and characters like Monica will get the right spotlight, maybe a future solo book. Finger crossed!